As the name suggests, Whale Cove is your destination if you’ve ever wanted to experience beluga whales in the wild. The whales gather near the community in the fall every year, so be sure to ask about boating opportunities if you visit this time of year. 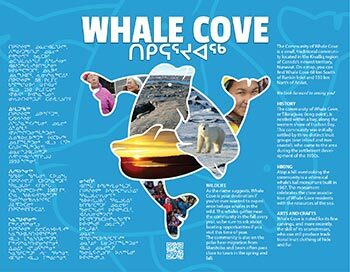 Whale Cove is still a very traditional community and locals hunt and fish to supplement their diets. Traditional foods here include caribou, fish, seal and beluga whale. The community is also on the polar bear migration from Manitoba and bears often pass close to town in the spring and fall. In recent years, bald eagles have been spotted in and around the community. These birds don’t usually travel north of the tree line, so catching a glimpse of one is a rare treat!